It’s hard to express our love of casual, homespun desserts. This peach cobbler recipe is a new favorite with it’s spiced peach filling and sweet biscuit top. 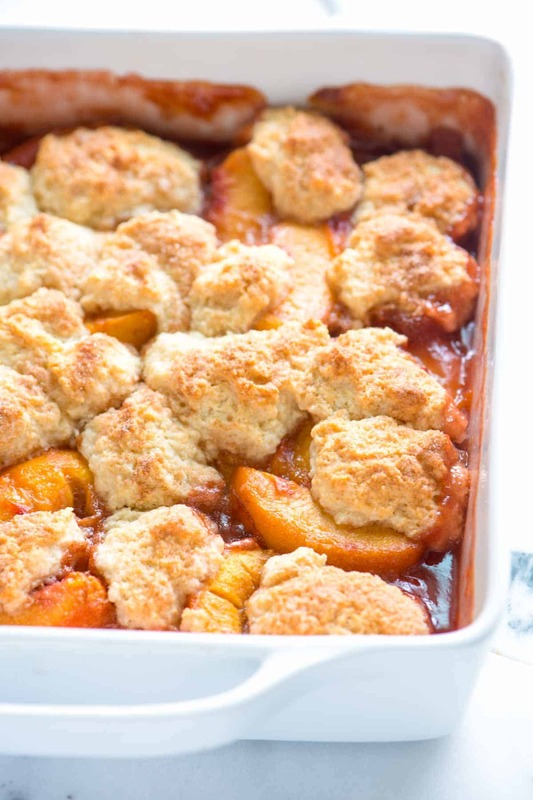 Jump to the Easy Peach Cobbler Recipe or read on to see our tips for making it. Cobblers, crisps and the like are perfect made in the summer when trees and bushes are brimming with sweet summer fruits. They are equally as impressive during the winter months, just use frozen fruits instead. YOU MAY ALSO LIKE: For another casual dessert, try our Easy Apple Crisp. We’ve even included a recipe video to show how to make it. 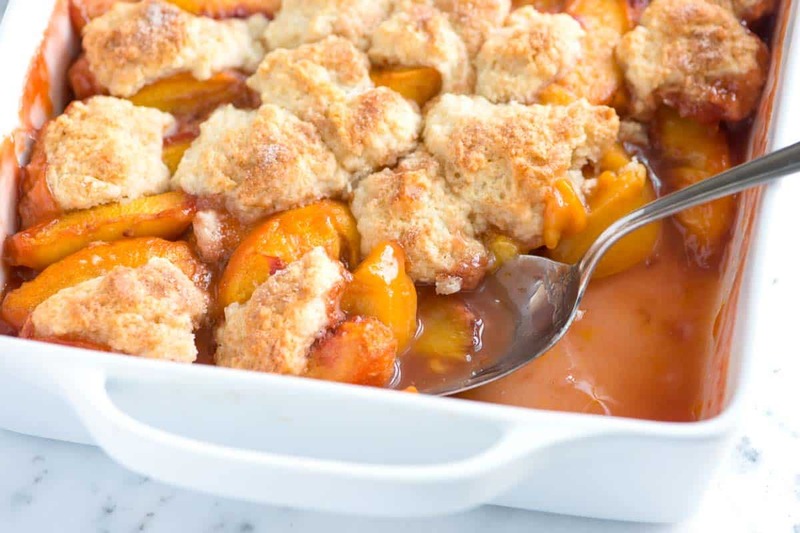 This peach cobbler recipe is simple. 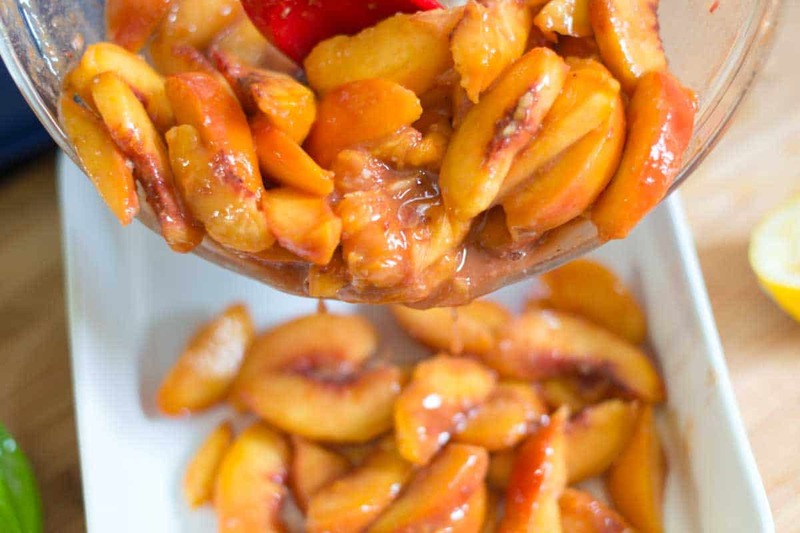 Fresh — or frozen and thawed — sliced peaches are tossed with lemon juice, sugar, cinnamon, nutmeg and a little flour to help thicken. Adding a cup of berries is a great idea, too. We give the peaches a head start in the oven while we make a sweet biscuit topping. To make the topping, cut cold butter into a mixture of flour, sugar, salt and baking powder. Then add just enough milk to form a soft dough. You could pat the dough down and use biscuit cutters to form perfectly round biscuits, but we like the cobbler to look as casual as possible. We just dot dollops of dough over the peaches. To finish things off, we sprinkle a little cinnamon-sugar over the biscuits before baking, adding a sweet crunch to the tops of the biscuits. Then bake until the peaches are bubbling and the biscuit top has lightly browned. YOU MAY ALSO LIKE: You only need one bowl to make these peach muffins with lightly spiced vanilla batter and ripe juicy peaches. Jump to the Vanilla Peach Muffins Recipe. 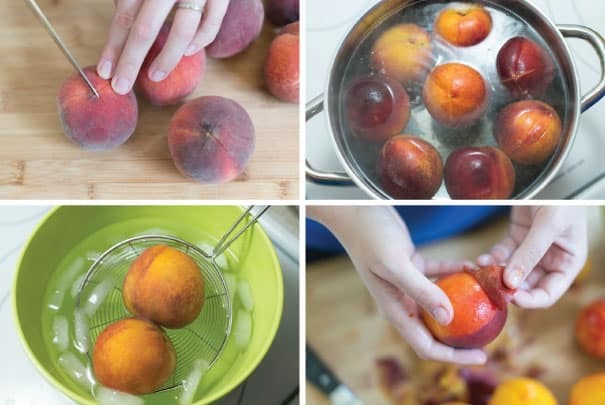 How to Peel Peaches: To peel fresh peaches, score an “X” into the bottom of each peach with a knife. Add to boiling water for 45 to 60 seconds then plunge into ice cold water. Peel skins from peaches. Nutrition facts: The nutrition facts provided below are estimates. We have used the USDA Supertracker recipe calculator to calculate approximate values. Nutrition provided is for the lemon garlic version of the recipe. I have been enjoying this recipe since around 1982 and still loving it. So quick and easy to make yeah. Last week, my daughter made this cobbler with fresh peaches. This was amazing, it’s the best I’ve ever tried. Thanks so much for sharing the recipe! God bless! Thank you for an amazing recipe I would like to add that as I have a fan oven leaving it in for 40 min burned my biscuits ??. I would say check after about 25 minutes, now I know I will be doing this quite often. I just used your recipe and I would like to thank you and your husband for your contribution to the world! It was absolutely delicious, I impressed my in-laws, my family, and the house smells amazing. 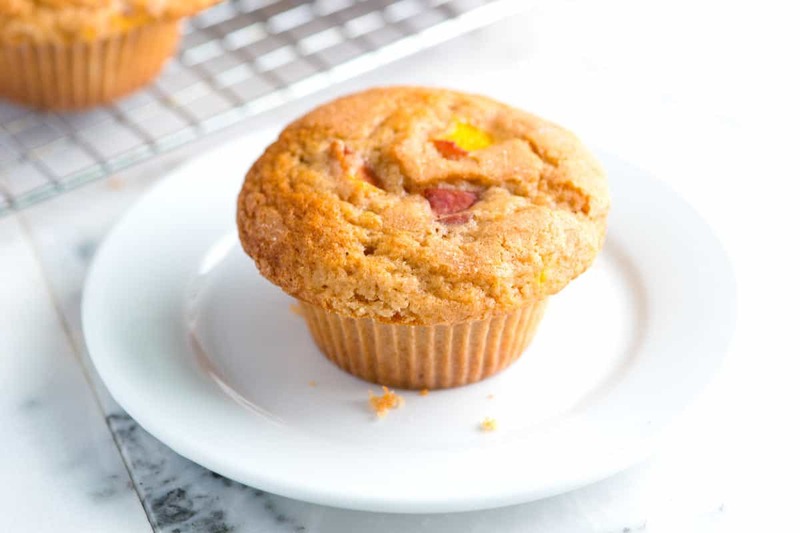 I have a peach tree, so I have enough to make your vanilla peach muffins for breakfast! I can’t wait to try other recipes from you guys. The weather’s too hot here (Northern California) for cooking these days in the 80’s and 90’s, but I sure do enjoy watching your videos. Great lessons for learning. Keep the salt down and sugar down for good health! Very best wishes to you hard-working, generous people! 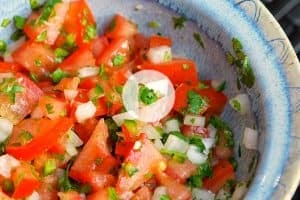 I just tested this recipe out and loved it! 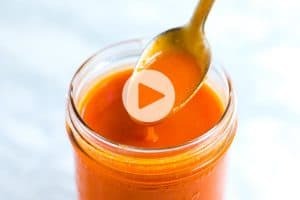 When following the recipe, for the peach filling it says 1/3 to 1/2 cup sugar; however, when preparing the filling, the directions say 2 tbsp sugar. Could you please clarify this? Thanks! Hi there — So sorry about that. We flipped the measurements. 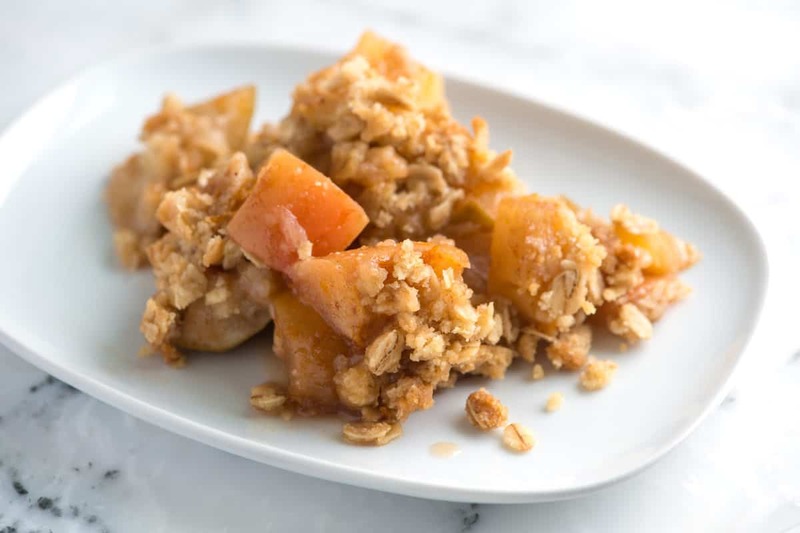 The recipe is fixed now, but to clarify, 1/3 to 1/2 cup of sugar is added to the peaches and an additional 2 tablespoons are added to the topping. I am all over this! 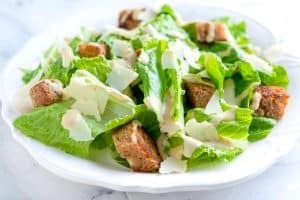 Such an awesome recipe!